Tibet's self-imposed isolation was interrupted at the beginning of the twentieth century when a Buddhist monk named Dorjieff succeeded in winning the favour of the country's spiritual ruler, the Dalai Lama. To complicate matters further, the clever Dorjieff had also enlisted the interest of Czar Nicholas II of Russia. When the Buddhist monk convinced the Russian Czar to invite the Tibetan ruler to Moscow, the international stage was set for political disaster. Despite the objections of his own xenophobic governmental advisors, the Dalai Lama accepted the Tsar's invitation. Yet this journey was never meant to be. When the news reached Delhi that Russia was interfering in Tibetan internal affairs a political panic spread across the British Indian empire. Lord Curzon, the viceroy of British India, an arch-Russophobe, and a Long Rider who had explored the Pamir Mountains on horseback, perceived the Russian move as a threat to England’s Indian Empire. Curzon immediately ordered Colonel Francis Younghusband to invade Tibet. In 1904 after several bloody and unequal battles against Tibetans armed with medieval weapons, the British army forced its way into Lhasa only to find that the thirteenth Dalai Lama had fled to Mongolia, a Buddhist land that had been an early protector of Tibet. The British victors were left holding an empty throne. But their forceful intrusion into the neutral sovereign nation of Tibet had far-reaching implications not only for the country, but for Long Riders in the 20th century. Within a decade of the invasion the wheel of history had turned. The British Viceroy signed an agreement with the Russian Czar ending their competition in this final chapter of the Great Game. By 1913, though the British were the pre-eminent foreign power in Lhasa, the Tibetans attempted to resume their national policy of spiritual and political isolation. But events on the world stage were conspiring against a resumption of hermit style policies. As the twentieth century advanced, an increasingly militant Japanese empire began to threaten the British empire from an unexpected direction. So while the Tibetans quietly managed their own affairs for the next thirty-seven years, the world inexorably marched towards the on-coming disaster of the Second World War. The Potala is the legendary home of Tibet’s hereditary ruler, the Dalai Lama. Tibetans believe the successive Dalai Lamas form a lineage of reborn rulers which traces back to 1391. According to Tibetan Buddhism belief the Dalai Lama is the incarnation of Avalokietsvara, the saint of compassion. A succession of Dalai Lamas ruled Tibet between the 17th century until the 1950s, when the current Dalai Lama fled the Chinese Communist rule of his country. But before the world embraced the madness of the world war, Tibet granted herself a special equestrian reprieve. This occurred in the early part of 1940 when a new Dalai Lama was chosen to rule the country. The fourteenth spiritual ruler of the country, whose journey into exile continues to interest the outside world, assumed the throne at the young age of seven. In 1940 the tiny ruler’s older brother, Thubten Jigme Norbu, rode across Tibet to visit his newly enthroned sibling. That “Story from the Road” entitled A Caravan Journey from Kumbum to Lhasa recounts how this Tibetan Long Rider witnessed an unspoiled and slumbering country, a Tibet still quietly humming its ancient prayers and unaware that the cataclysmic world war was about to come riding into its capital. Years later when he recalled his equestrian journey to Lhasa, Norbu recounted how his modest caravan of twenty-two men set off with no less than a hundred and twenty animals for the journey. Yet by the time Norbu had crossed Tibet his caravan had joined forces with an assortment of other mounted travellers. The resulting massive migration was estimated to contain a thousand travellers and twenty-thousand animals. Yet this was the calm before the storm and the world which Norbu witnessed was about to become a beloved memory. 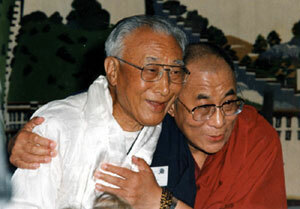 Tibetan Long Rider Thubten Jigme Norbu (left) is seen with his younger brother, Tenzin Gyatso, His Highness the Dalai Lama. The two brothers represent the religious, cultural and equestrian traditions now threatened by the repressive Communist Chinese occupation of Tibet. Though Henry Savage Landor had been treated harshly when he was caught trespassing in Tibet, the foreign Long Riders who attempted to break the Tibetan political blockade had generally been treated with courteous fairness. All that changed when blood-thirsty brigands not only murdered a Long Rider, but also slew the late 19th century game of “tag” which Tibet had been previously willing to play with uninvited intruders. The rules which said that Lhasa would simply send an explorer back home were forever altered when two idealistic young Frenchmen rode into the forbidden kingdom and encountered equestrian disaster. Born in the same year of 1904, Andre Guibaut and Louis Liotard became acquainted in the merchant marine. Determined to become famous explorers, the two studied geography courses in Paris, then set off for Tibet. Because their first venture into the country had gone undetected the French Long Riders felt emboldened with success. Alas that the brave young Frenchmen did not pay more heed to the dead bodies which served as a warning for what was to come, for on September 10th they were ambushed. A hail of bullets fired by concealed brigands slew Louis Liotard in the saddle. 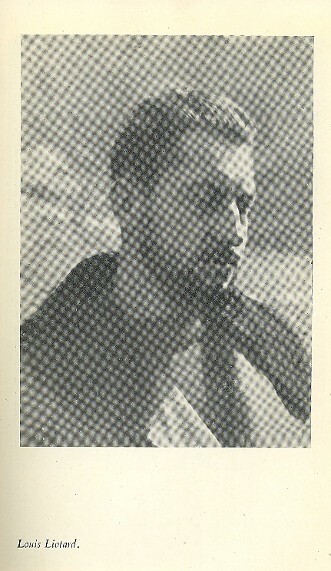 Andre Guibaut was forced to retreat or die. Liotard, whose body was never recovered, was awarded the Legion of Honour posthumously. Then, with the world rapidly descending into the madness of the Second World War, Andre Guibaut was appointed to the French diplomatic service by General De Gaulle. Yet this bloody prequel had set the stage for the appearance of two unusual Long Riders riding into Tibet. Soon after the Frenchman died a remarkable thing occurred. The American president, Franklin Delano Roosevelt, decided to send a mounted delegation to Lhasa. Like all political events, there were public and private reasons behind this decision. 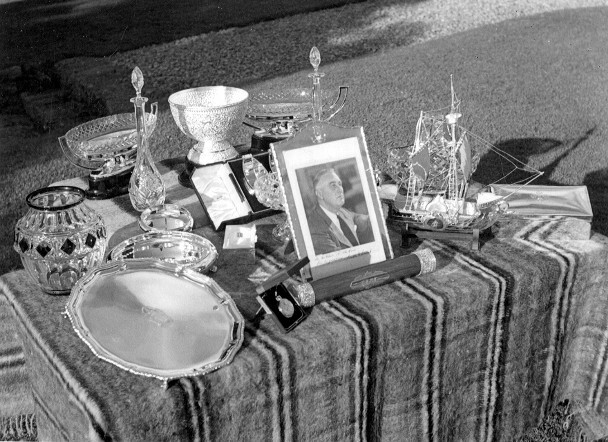 With the silver framed photograph of President Roosevelt went a personal letter to the Dalai Lama in a cylindrical casket, a gold watch and other gifts. The silver galleon (right centre) was presented to His Holiness by Colonel Tolstoy and Captain Dolan. After riding over 14,000 foot high passes, floating their horses across the Brahmaputra river on an ancient flat-bottomed barge, and convincing a number of suspicious Tibetan officials that they were ambassadors, Tolstoy and Dolan reached the small town of Yatung. There they were honoured by receiving from Lhasa the Red Arrow Letter, a courtesy gesture from the Dalai Lama’s court which authorized them to travel through the country. Armed with this ancient symbol, and four months after they entered the sparsely inhabited country, the weary Long Riders reached Lhasa and were finally introduced to the boy ruler of Tibet. Because of their special status, the Long Riders had even been allowed a special privilege. 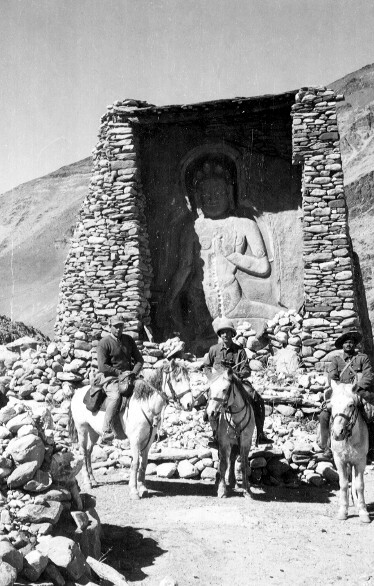 Count Ilya Tolstoy, left, Captain Brooke Dolan, centre, and a mounted Gurkha guide can be seen riding across Tibet in 1942. What Tolstoy and Dolan discovered was an intelligent ten-year-old lad who was keenly interested in the outside world. While the young Dalai Lama was eager to interact with the diplomats, his guardians were less encouraging. While cautiously welcoming of western assistance, the Tibetans feared an open alignment with America and England might anger their Chinese neighbours, who, even though they were involved in a battle to the death with the Japanese, still cast covetous eyes on Tibet. With their mission essentially concluded, and no formal permission for a road having been granted, the Long Riders received permission to depart in February, 1943. Their equestrian journey didn’t end however until they rode into a Chinese frontier outpost on June 21st. After their return to the United States, Dolan was sent back to China. Sadly, the young naturalist, turned army officer, was killed soon after combat had been officially concluded with Japan. So it was left to Tolstoy to record the tale of their remarkable equestrian journey in his “Story from the Road,” entitled Across Tibet from India to China. For the next few years no strangers came riding into Tibet. Much of the world was in ruins after the war and next door in China, Chang Kai-shek’s nationalist troops were busy battling Mao Zedong’s communists for ultimate control of the country. But by the spring of 1949, with the communists on the verge of seizing complete control of China, three remarkable Long Riders, a notorious adventurer, a man of God, and a spy on the run, came galloping into Tibetan equestrian history. Leonard Clark was a lifelong enemy of fear, common sense, and all the other elements that usually define “normal” people. Though only twenty-six when he first ventured into Asia in the early 1930s, he soon developed a style which saw him always armed with a keen eye, a sense of humour, no regrets and his trusty Colt 45 pistol. Before the onset of the war, Clark had delighted in telling his readers how he outsmarted warlords, avoided executioners, gambled with renegades and hung out with an up and coming Communist leader named Mao Zedong. In a world with lax passport control, no airlines, and few rules, the young man from San Francisco floated effortlessly from one adventure to the next. When he wasn’t drinking whiskey at the Raffles Hotel or listening to the “St. Louis Blues” on the phonograph in the jungle, he was searching for Malaysian treasure, being captured by Toradja head-hunters, interrogated by Japanese intelligence officers or lured into shady deals by European gun-runners. Before becoming a Long Rider, Leonard Clark had been a dare-devil aviator and espionage agent. So it wasn’t out of character for him to announce the he was going to raid Tibet on horseback. With such sterling references it wasn’t surprising that during the Second World War Clark was chosen to head the United States espionage system in China. When that global conflict was concluded, Clark turned his relentless energy towards exploring the most dangerous and inaccessible places on the globe. Case in point was his decision to lead a mounted expedition of Torgut tribesmen into Tibet. The official reason for Clark’s decision to venture into the mountainous kingdom on horseback in early 1949 was to find and measure a mysterious mountain in the Amne Machin range rumoured to be higher than Mount Everest. The only problem was that the sacred mountain was guarded by the fearsome Ngolok tribesmen. Yet romantic adventure ran deep in Clark, which helps to explain why he was journeying through one of the world's least known and most forbidding regions in the centre of Asia. There were also been rumours that Clark would use his equestrian expedition to launch an anti-Communist rebellion in Central Asia and prepare an impregnable base for General Ma Pa-fang, a violently anti-communist Moslem general. In his book The Marching Wind Clark describes the panoramic story of his mounted exploration in the remote and savage heart of Asia, a place where adventure, danger, and intrigue were the daily backdrop to wild tribesman and equestrian exploits. Amply illustrated with Clark’s photographs, as well as maps he drew in Tibet, this rediscovered classic was originally published shortly before the intrepid author died in a Venezuelan jungle looking for diamonds. Tibet has never been short of miracles, so it shouldn’t surprise you to learn that when the Chinese Communists decided to invade the ancient kingdom of Tibet it was a Long Rider who galloped over the Himalayas in search of help. Soon after the Second World War concluded a young Scottish medical missionary named George Patterson followed a special calling to travel to Tibet and be of spiritual and medical use to the country’s people. Patterson, who eventually spoke the language fluently, became Tibetan in all but name by adapting the country’s clothing and customs. The talented horseman was thereafter befriended by the leaders of the powerful Khamba tribe of Tibetan horsemen. So it was thanks to his companionship with God and his own strength of character that Patterson found himself immersed in a lifestyle so full of adventure that in today’s tame world it seems nearly unbelievable. It was this unique combination of skills and coincidence which caused George Patterson to undertake an emergency equestrian journey across the wildest parts of Tibet. Though it was winter George was asked to ride over the Himalayas, down into northern Assam, then venture on by rail to Delhi in the hope of organizing a diplomatic and military rescue. But before Patterson ever worried about reaching the warm capital of India, the Long Rider had to consider the minor fact that he was being asked to ride over 20,000 foot high mountains in sub-zero temperatures. Plus there was the minor inconvenience that even the Tibetans weren’t sure if the proposed route was passable. Long Rider George Patterson, (left) and his Tibetan companion, Loshay, made a historic journey over the Himalayas in the vain hope that the United States, England and India would come to the rescue of Tibet. Yet Patterson’s faith in God, and his desire to help Tibet, weren’t going to be denied. The snows on the high passes might beat him, but if he could find the villages he had authority to commandeer relays of food and transport. As for his companions, the Khamba tribesmen who rode with him were Tibet’s most noted horsemen. Besides, after having lived through the harsh Tibetan winters, the Long Rider was a superb horseman whose body was as efficient as the Tibetans’ in low temperatures. The resultant ride saw Patterson, and his main companion, the Tibetan named Loshay, risking their lives countless times as they rode south through the snow-covered mountains with their desperate message. Though Tolstoy and Dolan had come bearing gifts, in Tibet’s hour of need the United States and Great Britain forgot their previous promises. They watched instead from the sidelines as the Chinese first invaded, then put the country to the sword. There was some diplomatic lip-service from London and Washington but their words were hollow. Tibet was imprisoned in Chinese chains and Long Rider George Patterson was the last outsider to ride across a free Tibet. This remarkable Long Rider, who is now in his mid-80s, recounted his astonishing journey in his amazing book entitled, Journey with Loshay. How ironic then that the next Long Rider to venture into Tibet was an American spy fleeing from the same Red Chinese whom Leonard Clark and George Patterson tried to halt. They called it the Atomic Age because Hiroshima and Nagasaki had been levelled by atom bombs. Yet even though the threat of mass mayhem had been let loose on the planet, over in occupied Tibet the ancient concept of personalized murder still lurked on the trail leading to Lhasa. With George Patterson busy in Delhi trying to convince Indian Prime Minister Nehru to assist Tibet, and Leonard Clark galloping around with Torgut tribesmen looking for a mysterious mountain, a Long Rider tragedy was about to unfold in Tibet. In the immediate post-World War II period the Soviet Union began work on its own atomic program. In order to monitor their progress the newly created CIA sent their agent, Douglas MacKiernan, to Urumchi, a city in China’s western Sinkiang Province. Working from that consulate MacKiernan investigated the Soviet mining of uranium in northern China and secretly planted electronic sensors to detect the Soviets' first atomic blast on August 29, 1949, in Kazakhstan. When the Communists seized control of China MacKiernan was ordered to evacuate. But conditions in the east had deteriorated so seriously that MacKiernan had only one option, escape by horseback across one of the worst deserts in the world and ride on to the still free Tibetan capital of Lhasa. Accompanying him on this wild mission would be Frank Bessac, an young American student turned espionage agent who had been patrolling the Chinese-Mongolian border, and three fervent Russian anti-communists. Before this unlikely group saddled up MacKiernan wired Washington DC to report that the communists were expected to seize Urumchi immediately. Then, with his official duty done, MacKiernan, Bessac and the Russians set off towards Tibet with their gear, which included machine guns, radios, gold bullion, navigation equipment, and survival supplies. Ahead of them lay the notorious Takla Makan desert, which they managed to cross after great hardships. The spies turned Long Riders were then forced to ride up into the mighty Himalayas in order to reach Tibet. During the course of their journey MacKiernan had managed to radio Washington to report their progress. The American government in turn had managed to send word to the Dalai Lama’s government, asking the Tibetans to extend diplomatic sanctuary to MacKiernan and his men when they reached Lhasa. The problem was that MacKiernan and his men were due to enter Tibet before any official word of greeting could be sent from Lhasa to the border. And unlike Tolstoy and Dolan, who had been carrying the Dalai Lama’s easily recognizable two-foot-long “Red Arrow” of introduction, MacKiernan’s group had no such visible sign of authority. Under such rare conditions are disasters born. After having struggled over the Himalayas, MacKiernan, Bessac and the Russians believed their freedom was in sight. Before them lay the Tibetan outpost which spelt safety. It was April 29th, 1950, Douglas MacKiernan’s birthday – and he was about to die.